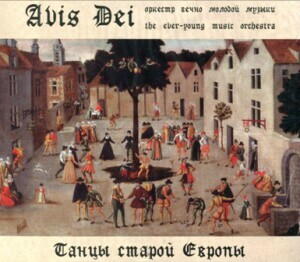 AVIS DEI - "Early European Dance"
Renaissance gave a great impetus to many arts including dance. In fact, prior to that, in the Medieval era, dance was not considered art at all, and it was not until the 17th century that it gained its rightful place in life and culture. As dance was getting recognition as a useful, noble and worthy pastime, more and more attention was paid to its description. Separate descriptions appeared first, followed by full-scale treatises. Little is known about the dances of Middle Ages and Early Renaissance. At that time people did not consider them important enough to be given a detailed description. Still, a lot of pieces of music preserved till nowadays. And although the information we know may sometimes be insufficient to reproduce the dances exactly the way they used to be, the yearning to dance can be very strong. Thus, some indirect evidence, the tune and depiction of dancing pairs contributed to the creation of La Regina dance based on a saltarello from an Italian manuscript of late 15th century.